This is a general purpose chassis mounting mains transformer. The transformer has 240V primary windings and center tapped secondary winding. The transformer has flying colored insulated connecting leads (Approx 100 mm long). The Transformer act as a step-down transformer reducing AC - 240V to AC - 12V. 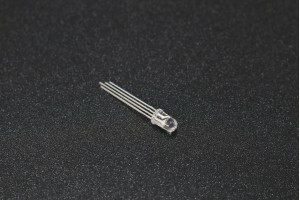 The K2010 4N35 series consist of an infrared emitting diode, optically coupled to a phototransist..
BC547 is an NPN bi-polar junction transistor. A transistor, stands for transfer of .. This keypad has 4 buttons, and since every key has its own wire line, no matrix code is required -..
Bourns Trimpot trimming potentiometers perform a variety of circuit adjustments in all types of el..
Electrolytic decoupling capacitors 1000uF / 50V. These capacitors are great transient/surge suppre.. Onboard precision micro current transformer, which can transform AC signals of large current into ..